One of the oldest, biggest, and best churches in Florence. Part of the same complex that has the the library Michelangelo designed for the Medici family. All of the Medicis are buried here. The Basilica di San Lorenzo (Basilica of St Lawrence) is one of the largest churches of Florence, Italy, situated at the centre of the city’s main market district, and the burial place of all the principal members of the Medici family from Cosimo il Vecchio to Cosimo III. It is one of several churches that claim to be the oldest in Florence; when it was consecrated in 393 it stood outside the city walls. For three hundred years it was the city's cathedral before the official seat of the bishop was transferred to Santa Reparata. San Lorenzo was also the parish church of the Medici family. In 1419, Giovanni di Bicci de' Medici offered to finance a new church to replace the 11th-century Romanesque rebuilding. 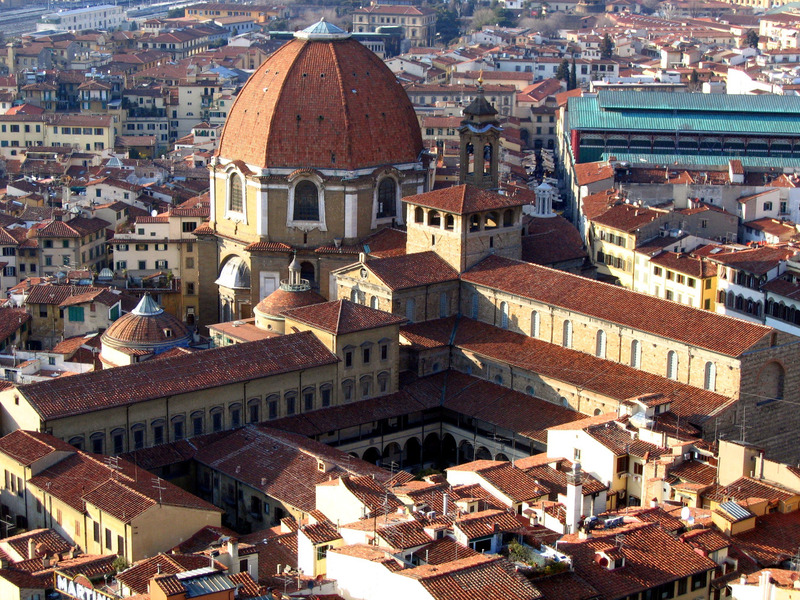 Filippo Brunelleschi, the leading Renaissance architect of the first half of the 15th century, was commissioned to design it, but the building, with alterations, was not completed until after his death. The church is part of a larger monastic complex that contains other important architectural and artistic works: the Old Sacristy by Brunelleschi, with interior decoration and sculpture by Donatello; the Laurentian Library by Michelangelo; the New Sacristy based on Michelangelo's designs; and the Medici Chapels by Matteo Nigetti. Check out the full Wikipedia article about San Lorenzo, Florence.